That was a fun expedition, and the start I’m sure of a new hobby. 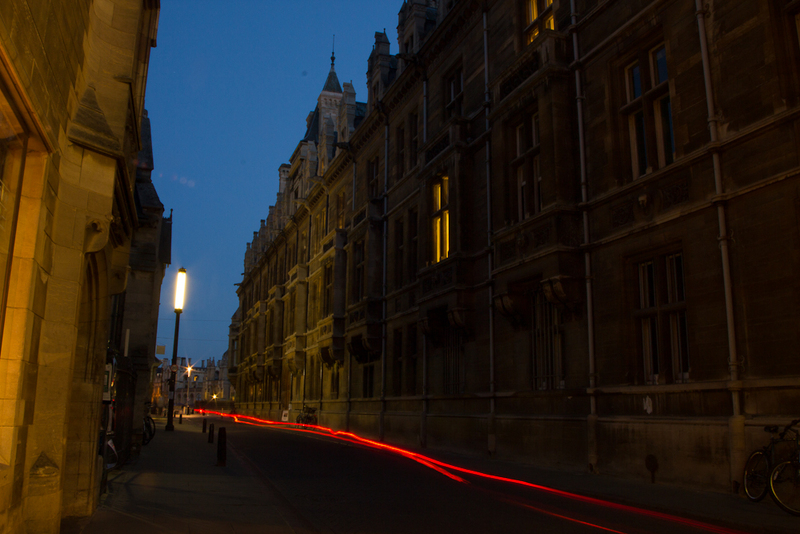 Well, that was an unexpectedly stimulating and enjoyable evening taking photographs in Cambridge. 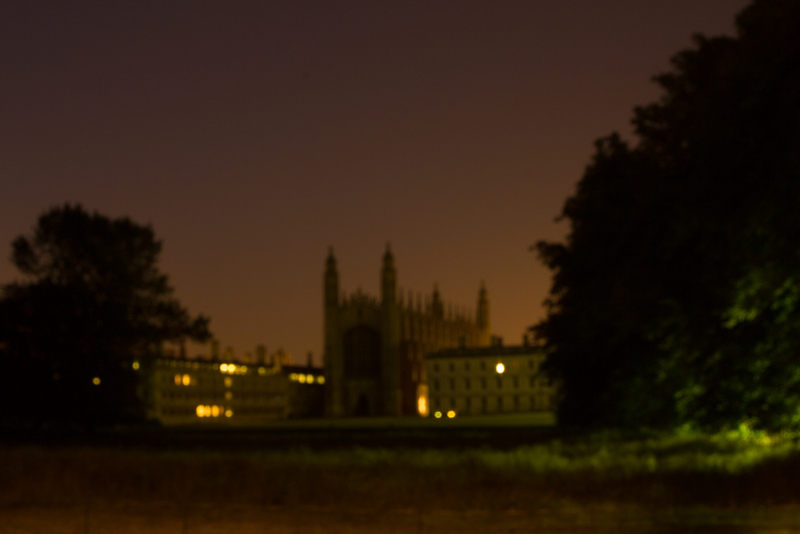 I think I feel a new project emerging: Cambridge After Dark. I’ve not downloaded the images yet so it’s too early to evaluate this initial outing. But this was only ever going to be a trial run to learn from. I enjoyed it so much that I already consider it a success. I already knew that automatic focus doesn’t work in the dark and it’s hard to focus manually in the dark, so I shot at f22 to maximise focal length. My first few shots on AV mode were probably too dark, so I switched to bulb setting on manual mode and kept increasing the exposure times, until my final shot was 10 minutes. I arrived in town almost exactly at sunset, so the sky was still pale. I like the contrast with dark buildings lit by artificial light. Soon after I arrived, I startled a heron when I crossed a narrow wooden bridge over a stream in Newnham. It flew towards the mill pond where I saw it lurking a few minutes later in the shadows by the weir. I’ll be ready for it next time. There’s a shot I want to get on my next expedition of a line of gargoyle head water spouts silhouetted against the sky in Trinity Street. I think I’ll need the 300mm lens. I’d intended to park in The Backs but the parking bays were full. 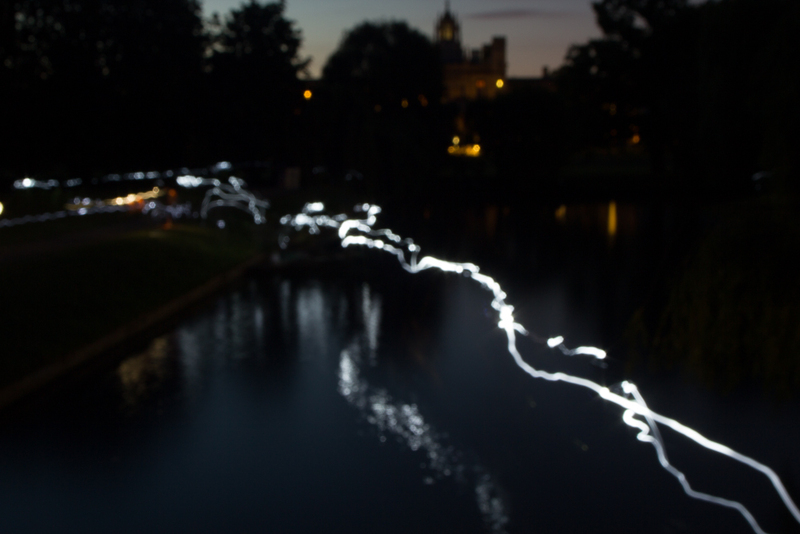 It turned out there was an open air choral concert by the river in the grounds of Trinity College. I stumbled across it by accident, catching the final few minutes. The sounds were beautiful, especially in the disappearing light, a magical experience, made even better by its unexpectedness. You won’t discover experiences like that without getting out there. To prevent people from accidentally bumping my tripod while the shutter was open, I stood close beside it protectively. I should take a back pack next time, to carry extra items, such as a jersey taken off because I was warmer than expected. Refreshments would be a good idea. I enjoyed it so much that I’m finding it hard to sleep tonight. Unfortunately I’m at work tomorrow. I’d much prefer a lie-in followed by a session of downloading photographs for import into Lightroom. It would be better if I could rearrange my work schedule for next time. And that’s all for now. What more will I learn when I’ve seen the photographs? I had dinner with friends last night, who asked me if I’d done much photography recently. 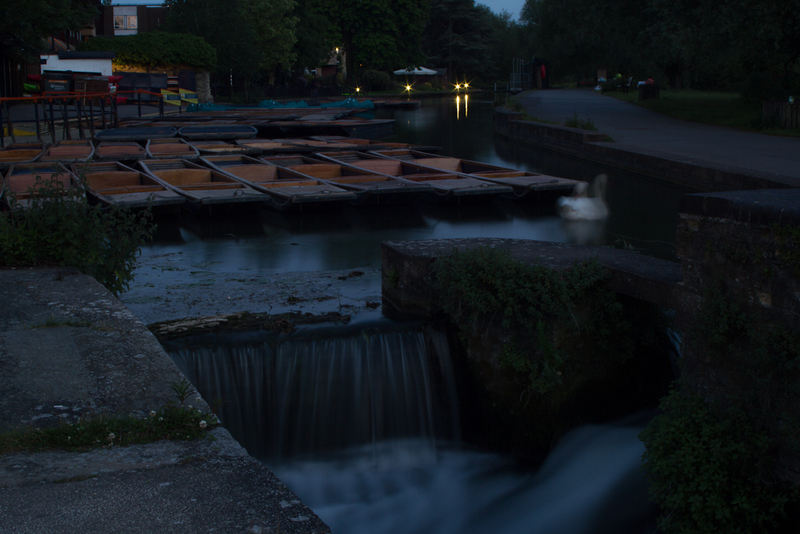 I had to say no, but I’ve been thinking about some low light photography in Cambridge one Sunday evening when it’s quiet. So, today being Sunday, I’ve been assembling and preparing my kit. Battery: checked, SD card: cleared and checked, remote shutter release cable: tested check. tripod mount: found and transferred from another camera. I’ll travel into town by car which means I can take a spare camera as back-up, so that means testing and assembling another set. Still, it’s exciting! I’ve not chosen a creative project to work on for a long time, so this is long overdue. Smoke me a kipper, I’ll be back for breakfast! I recently purchased and downloaded ‘Much Ado About Nothing’ from Digital Theatre. It’s a recording of the excellent production with David Tenant and Catherine Tate as the leads Benedick and Beatrice. I usually find Shakespeare on screen to be dull and unengaging compared to live performances, but this was both funny and moving, so in the latter respect it was similar to Baz Luhrman’s ‘Romeo+Juliet’, which was the first time I had believed and felt the on-screen emotions. Unlike that film, though, and unlike the Kenneth Branagh version, this Much Ado was still contained within the confines of a theatre. It employed unusual techniques, however, such as a revolving stage which meant that there was always the impression of further action taking place within the dark shadows of the colonnade that kept rotating in and out of view. Without the recording, I would not have experienced this wonderful production, so I’m glad it exists, but I would still prefer to have experienced the joy and humour live on stage, which makes me glad we’re once more approaching the season of outdoor Shakespeare. This year the festival includes Much Ado About Nothing, but how will it compare to Tenant and Tate? I’ll certainly take the opportunity of seeing the rarely performed Titus Andronicus, which is not for the faint-hearted, and adding to my collection of Macbeth productions, which peaked with the WWI-set production by The Royal Shakespeare Company in The Gulbenkian Theatre in Newcastle-upon-Tyne. My favourite outdoor Shakespeare remains Comedy of Errors by Illyria, but that’s going back quite a few years now, remaining a bright highlight standing out among many others. I was in Edinburgh recently, where I watched a fascinating, if overlong, television documentary on the life and work of David Hockney. The location of such viewing would normally be unimportant, but I mention it because the following day (i.e. yesterday), I went to an display of Roy Lichtenstein’s later work in the Artists Rooms strand at the Scottish Gallery of Modern Art. While I was growing up in Edinburgh, I would frequent the gallery in the Royal Botanic Gardens now known as Inverleith House which is where I first encountered many of the works now on permanent display in the Gallery of Modern Art. My visit yesterday felt like a chance encounter with familiar faces or past loves from long ago (literally in the case of some portraits), and the realisation of recognition, like Nicholas Jenkins encountering Jean Duport in an art gallery in the final volume of ‘A Dance to the Music of Time’, was an overwhelming wave of memory like Proust’s famous taste of madeleine cakes described in ‘A La Recherche du Temps Perdu’. But that was’t the only connection occurring across time. Lichtenstein was developing his iconic and distinctive style at the time Hockney was painting in California, and the latter’s ‘Rocky Mountains with Tired Indians‘ was on display yesterday. The documentary had discussed Hockney’s efforts and explorations to depict water, so it was interesting that the exhibition explicitly covered Lichtenstein’s explorations to depict reflections on glass. In both cases it was important for the artist to consider the role of the light effects on the finished work, distorting or obscuring what lay behind. Some of Lichtenstein’s reflections were highly stylised bands using large versions of the brightly coloured Benday dots of his trademark style, which contrasted with his use, in ‘In The Car‘, of relatively simple lines to indicate glass and possibly movement. The faces in that painting were also very familiar to me because, as a student, I had a large poster of it which I bought in The Third Eye Centre in Glasgow. That poster dominated every flat I rented for many years and I would ponder it for hours. In a more distant personal connection, the exhibition also contains a flattened but solid explosion like the one in ‘WHAAM‘. That painting was my first encounter with Lichtenstein’s work and it quickly became a favourite. It was my introduction to Pop Art long before I encountered Warhol’s soup cans or Monroe prints. The solid explosion in the exhibition, appropriately high up on the wall like the jet fighter being destroyed mid air by a missile, has at least three flat layers arranged to give it a remarkable appearance of volume. But that wasn’t the only reference in the exhibition to earlier art works . One was a direct development of Lichtenstein’s ‘Art’, with the word alone inside a border and half-hidden by ‘reflections’ on glass, while another, of a yelling baby, referred to Edvard Munch’s ‘The Scream‘ which I saw in the same gallery a couple of years ago. Stylised lilies floating on polished metal referred to Monet’s series of lily paintings. I was unaware of Lichtenstein’s nudes painted in the 1990s in his trademark style, but I like them a lot because they unexpectedly tap into the rich tradition of the human form in art. This morning, being on good time for my train south, I called into The City Art Centre near Waverley Station but the current exhibition was temporarily closed so I had a coffee in the gallery’s cafe where they were playing my personal favourite ‘Telephone and Rubber Band’ by the Penguin Cafe Orchestra over the sound system. That piece always makes me smile. Afterwards I went to The Fruitmarket Gallery across the road where there was an exhibition of Brazilian sculpture called ‘Possibilities of the Object.’ I found it all very obscure, and indeed the accompanying leaflet tellingly described one work as, “…neither painting nor sculpture, but an object that resists immediate comprehension.” Another work there, however, at least had some meaning for me. It was an open attache case with rows of nails filling one half and pointing straight up, rendering the case unusable, and hinting darkly at the nastier side of business . This seemed a direct reference to Man Ray’s ‘Gift‘, an iron with nails soldered perpendicular to the otherwise flat base plate. That famously unusable iron was my personal introduction to Surrealism, so seeing it referenced in an exhibition that I had only chanced to visit, seemed like another happy conjunction across time and space. And the moral of this long, rambling story is that interesting documentaries on television are all very well, but it’s still important to get out the door and let them inform and expand a personal encounter with art in galleries. Today is officially Pi Day. If you write the date in the American format of mm/dd/yy you get 03/14/15 which is close to 3.1415, which means that today should really be called American Pi day. But that has connotations of the film of that name. Pi Day is celebrated each year in America. However, it will be celebrated especially today at 9:26:53 (either AM or PM) because that’s as close as you can get to 3.141592653. I wish my father were alive and aware enough to experience this. 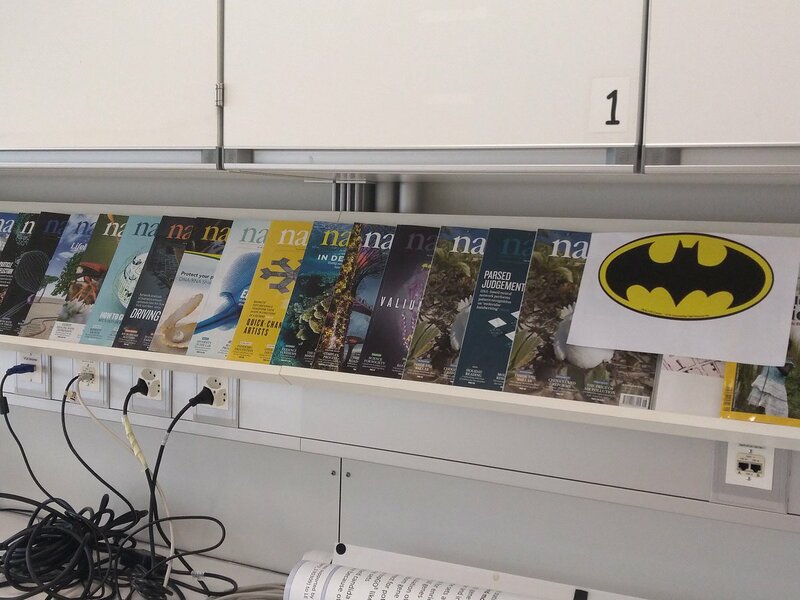 It would have appealed to his sense of fun with numbers. At the risk of sounding like a pedant arguing the precise start of the new Millennium, I would point out that Pi, expressed as a decimal, to five significant places is 3.14159. If you round that up, it becomes 3.1416, so this time next year will nearly be as good as today but without the added bonus of hours and minutes. (See also Pi Approximation Day on 22nd July (22/7). Any regular readers out there will probably groan as Brian’s name is mentioned here once more. Its most recent appearance in this blog was a quote from him on a poster for Penguin Cafe. This time, it’s because I recently went to see David Lynch’s’Dune’, some thirty years on since its original release, and he appears early in the pre-film credits: “Prophecy Theme by Brian Eno”. The Arts Picturehouse’s publicity described the film as “under-valued”, but I was keen to see it again on a large screen, and I certainly wasn’t the only one as the cinema was virtually fully-booked. Yes, the film was still a disastrous mishmash of exposition giving its stars very little to do, and its battle scenes cling to old, out-dated war films, so it doesn’t stand up well to expectations of emotional involvement in the action, but I still like its art direction vision of a futuristic Edwardian art deco. So, what of Brian’s prophecy theme? It was understated and subtle, especially in comparison to the rest of the soundtrack by Toto, almost to the point of being unnoticeable under the pumping sound levels pounding through the cinema like thumpers summoning giant worms. I was recently talking to one of the volunteers at work, discussing the well-known exercise in probability theory where there’s a game show with three doors. Behind each door is a prize, one of which is very valuable while the other two are worthless. The contestant has to pick one door, then one of the other doors is opened to reveal a worthless prize. The contestant then has the opportunity to change his/her mind and choose the remaining door. What is the contestant’s best strategy? The answer, perhaps counter-intuitively, is: switch and pick the remaining door. Precisely because it seemed counter-intuitive, I decided to write a simple programme to show the results of a large number of iterations, but, while planning the code, I proved to my own satisfaction that changing your mind is the better strategy. So I had the strange experience of learning through preparing to code, with the outcome that I didn’t need to write the code! the contestant picks one of two doors with the worthless prize, (a 2 in 3 chance), in which case it would be wise to switch. Since the latter course is more likely, the better strategy is to switch. QED. The revelation of the prize behind another door is merely a distraction. Conclusion: the discipline of writing an algorithm helps to think logically about the problem. That’s what Brian thinks about Penguin Cafe, according to their publicity material and I certainly wouldn’t disagree. They performed a rare concert last night in the impressive new concert hall at Saffron Hall, and played live on Radio 3 in the run up to the concert. Arthur Jeffes (son of Simon Jeffes, founder of the Penguin Cafe Orchestra) is in a difficult position. The group, now called Penguin Cafe, opened their concert in Saffron Walden last night with ‘Telephone and Rubber Band’, which never fails to make me smile, and closed their encore with the joyous ‘Music for a Found Harmonium’. Between these two numbers, they performed a mixture of old (‘Southern Jukebox’, ‘Perpetuum Mobile’, Bean Fields’, ‘In the Back of a Taxi’) and new pieces mainly from ‘The Red Book’ (‘1420’, ‘Black Hibiscus’, ‘Bluejay’, ‘Odeon’). Arthur introduced them all, often with fond reference to his father’s work, and sometimes mentioning his childhood memories of them. The older pieces, usually involved a wider range of instruments, such as a melodica, are still quirky, lively and eccentric, and obviously pleased the crowd. His enthusiasm for ‘1420’ was obvious, but he appeared slightly nervous when introducing two pieces as ‘world premieres’. He described a new piece called ‘Birdwatching’ as a reworking of a favourite tune by Cornelius, who is, apparently, a “Japanese Brian Eno”, which for me is a good introduction that made me warm to it in advance, and it rewarded my openness with the lively passion and quirkiness I expect of PCO. For the first encore piece, Arthur played solo piano for Harry Piers (sp? ), a piece he wrote for his father’s memorial. It, too, had emotion, presumably from the memories it evoked, despite its repetitive minimalist style, and was played with passion. In contrast, the newer work generally lacked the energy and eccentricity of the older pieces, which is why I described Arthur as being in a difficult position. The choice of encore was clearly justified as they finished to an almost unanimous standing ovation. Can Penguin Cafe create new work that meets the expectations of fans of the older music, and continue to perform the older pieces with the required freshness and vitality? On the basis of last night’s concert, they most definitely can, providing they don’t let it slide into bland niceness. After recently discovering the existence of The Phantom Tollbooth by Norton Juster, I promptly downloaded a copy from Amazon and read it. Wow! It’s crying out to be animated. Yes, I know MGM released a film of it in 1970, but I’ve never seen it, and I don’t want to until I’ve developed my ideas of how I would tackle it. The movement in one scene really stands out for me: where Humbug, Milo and King Azaz the Unabridged are discussing whether or not Milo should rescue the Princesses Rhyme and Reason from the Castle in the Air, with Humbug believing and arguing two contradictory points of view. I can clearly imagine Humbug sliding back and forth from king to boy, alternating between outrage and persuasion. It’s such a stimulating story that I’ve started using trello to plan a film. Its system of lists and cards that can be dragged and dropped (or should that be drag-and-dropped?) is perfect for experimenting with different arrangements.